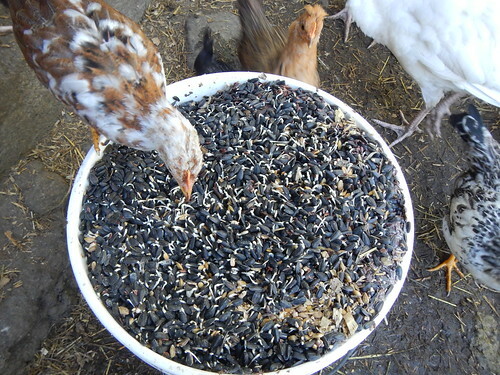 We’ve been doing the fermented feed for a while now and have are trying to evaluate whether it is working, whether it’s worth it, and if we are missing anything that the birds need. It would certainly be easier to go back to a bagged pellet, but we think there is a benefit in nutrition for the birds and cost for us, but it’s hard to evaluate. We would like to avoid GMO feeds, and we had wanted to get away from soy as well. But we had serious protein issues from the beginning. The ducks and geese had the all-night bug bar (solar landscape lights), and the chickens seemed ok, but the turkeys told us immediately that they weren’t getting enough protein. The only legume we could get besides soy was peanuts. It helped, but not enough. So we broke down and bought soy. Problem solved, even though we don’t really like the solution. By the way, once we provided the soybean, the peanuts were ignored. These are still in the shell but sprouted, so perhaps shelled ones would be different. They would also cost far more, even if we could get them, which we cannot. We’ve also had a cold snap, so the bug bar is not doing as well, much to the disgust of the geese, who have started dismantling the lights in protest. We’ve had sunflower seeds in the mix from the beginning, to provide protein as well, but it clearly wasn’t enough. Whole oats were another non-favorite. We switched to crimped oats with good results. I suspect the hefty husk on whole oats as the problem. We tried to buy millet. It was very popular but not affordable. It turns out that big box store bird seed costs half as much. For the same price as fifty pounds of feed store millet, we get the millet plus 50 lbs of corn and sunflower. We’re big boxing sunflower for the same reason. It’s the same stuff for $0.10/lb less. In order for the sunflower seeds to be popular, they really need to be at the top of the buckets and sprouted, not just fermented and soaked in the mix. They’ll all get eaten by the end of the day, but are clearly last choice. If they are sprouted, however, the birds all adore them. The other issue is minerals. Between grass and sprouts, we think the vitamins are controlled. Layer pellets have minerals added to them. Forage, and now fermented/sprouted grain, do not. The situation was even worse in Marlow. We would get eggs that could not even be picked up because the shells were so weak. Here, they’re just fragile. So, we’re free feeding oyster shell and some mineral mix we found at the farm store. If we keep this up, we’ll have to get way more formal on minerals. But, the important question, is the experiment successful? I don’t know, and I can’t think of what records I should have kept in order to have an answer. In all previous summers, our July and August bird feed bills have been minuscule even with a bag of oyster shell. 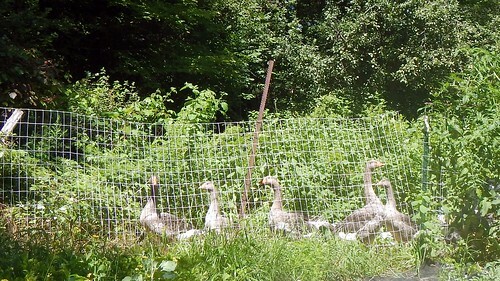 This year we have twice the number of birds we’ve ever had, including more big birds (geese). (27 geese! What were we thinking?!) We really have more birds than we have easily-accessible pasture for, and especially more than there are bugs for. So, I have no baseline. We’re spending more money, we’re feeding more birds, on different pasture with fewer bugs, in odd weather. We are going to see about having a mill mix a custom order for us and bag it, and see if we buy it by the ton that might save both money and time, and we could probably have minerals mixed in as well. There’s a bit of work involved in making up the batches every day that it would be nice to skip. We are also considering moving to larger containers rather than continue using five-gallon buckets. About half the time we are feeding two buckets now, so using six buckets total means that the grains are often only soaked for three days, when the optimal time to ferment is five to seven days. But finding space in the basement for the winter where that many large plastic trashcans will work is going to be tricky. The basement here is very, very small, and filled with an oil tank, water heater, furnace, etc. It’s the only place where we’ll have access to water that isn’t frozen, however, unless we move the whole operation up into the main house, something we’re very reluctant to do. To help with the protein problems, we are starting to raise mealworms. We bought 5000 of the beasts and they arrived this week, and are currently split up in five long plastic containers filled with wheat bran and a few slices of potatoes. We’ll see how this goes. Soy is cheap, but mealworms are a much healthier way to get protein into the birds, and just mentioning it in passing here has generated much interest in selling live mealworms locally. We aren’t sure how quickly these guys will reproduce, nor how easy it will be to farm them, but here’s hoping. 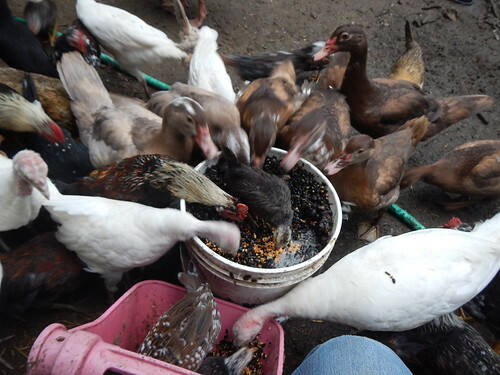 This entry was posted in Chickens, Ducks, Geese, Mealworms, Turkeys. Bookmark the permalink. Post a comment or leave a trackback: Trackback URL. How is the fermented feed program going? 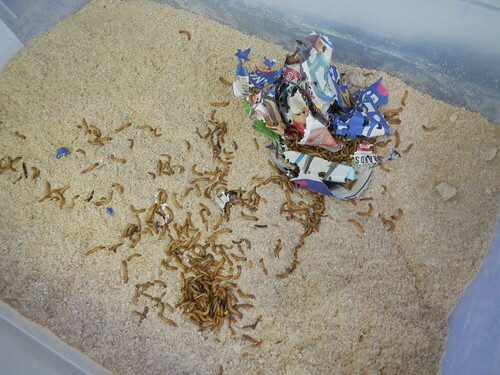 How about the mealworms? We’re thinking of raising mealworms for our chickens.